Bone (or “Osteon”), is an alphabet that is done with a broad edged pen – a 6mm Parallel pen is recommended. Working with this alphabet promotes awareness of the white shapes between and within the strokes. Bone lends itself to close placement of letters, and calls for framing white spaces with its broad black strokes as you explore pen twists, rotations, pivots and slides. A great hand for designers, calligraphers and letter lovers, Bone is a modification of the classical upright bookhand and was invented by scribe Jacqueline Svaren in 1972. 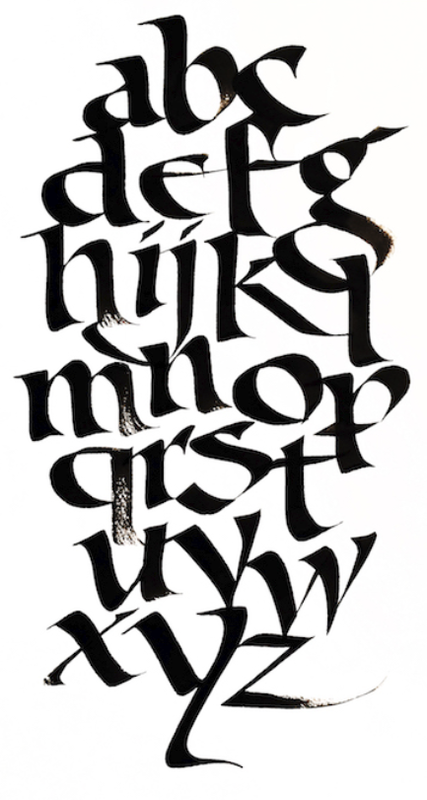 This alphabet works well when written without guidelines. Once you are comfortable with the letterforms you can experiment with various ways of using this hand, through a series of demonstrations and design exercises. Bone is organic, fun, warm, and assertive; it is essentially drawing with shape.